The Student Central Team at Florida State University is happy to announce the roll-out of the new myFSU portal, a one-stop shop for all of a student’s needs, and a gateway to myFSU Student Central. Rather than going through Blackboard Secure Apps, use the myFSU portal to easily manage your Fall 2013 class search, registration, financial aid and personal information. It will change how you, as a student, will register and manage financial aid for the Fall 2013 semester! myFSU is a tool that is much overdue and will replace (in phases) the aging, fragmented systems of the past. A portal community for employees will also launch in the coming months. However, for the upcoming March 4th student launch, there will be limited functionality focused on class registration and financial aid for the Fall 2013 semester. Go to my.fsu.edu and login with your current FSUID and password to start planning your future as a Nole. Questions? 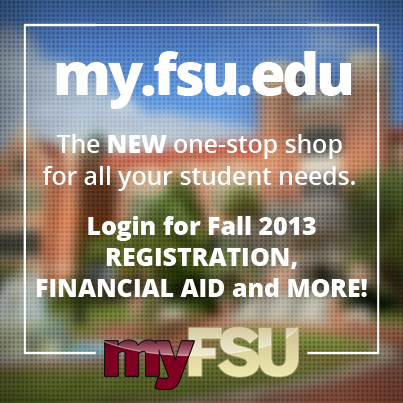 Visit sc.my.fsu.edu for help navigating the new system or contact the Registrar’s Office at 850-644-1050.